Search the newest Eldorado real estate listings with Santa Fe Properties below! Just 10 short miles north on I-25 from downtown Santa Fe lies the scenic rolling hills of Eldorado — a wonderfully diverse, amenity-rich community of approximately 4,000 homes. First developed in the early 1970's as a satellite community to Santa Fe, Eldorado is primarily zoned as rural and single-family residential, with properties from 1 to 25 acres. The majority of properties are home to singles, retirees, couples and families with school age children. Known for its starry skies and peaceful open spaces of piñon and juniper, Eldorado's diverse range of home styles include Santa Fe Pueblo, Passive Solar and Contemporary Territorial and generally list between $250,000 and $600,000. Santa Fe Properties can provide buyers and sellers with a wealth of knowledge on the area. Don't just take our word for it! Browse the newest listings below or keep reading about Eldorado homes for sale. Jumpstart your Eldorado real estate search by registering with Santa Fe Properties. We'll send you listings that meet your search criteria when they become available. The one common band in this suburb is pride and support of its community. Eldorado homes for sale are in a clean well-maintained area with its own community center, pool, soccer fields, small commerce center, library, bike paths, dog park, tennis court, senior center, community garden, community school, medical and veterinarian, and emergency services. Participation in the community events is the resident's forte. Serving K-8 students from Eldorado, Lamy, Galisteo, Glorieta and the surrounding area, Eldorado Community School has repeatedly placed among the state's very best. Eldorado K-5 students participate in art, music, and physical education, while middle school students' elective classes include PE, piano lab, Spanish, German, art, orchestra, band, and choir. Eldorado also provides a rich offering of activities such as enrichment programs, middle school sports, yearbook, and student council. There's so much to do in Eldorado — all of which is connected by the seemingly endless miles of paved and dirt trails that appeal to retiree walkers, bikers, moms on a stroll and runners, to name a few. Eldorado Community Center has tennis and basketball courts, soccer fields, a dog park, playground, as well as a pool for family fun and lane swimming. The rail trail runs through Eldorado south to the Galisteo Basin trails, perfect for hiking or mountain biking. 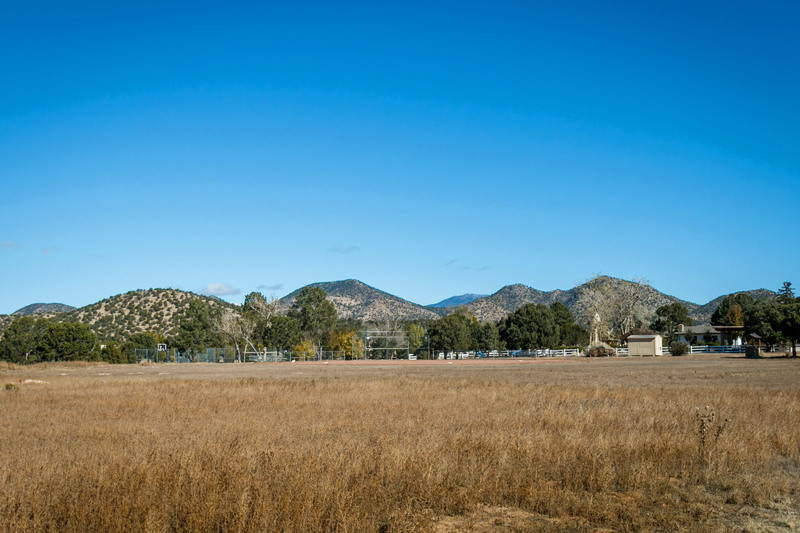 And with it's horse stable and miles of open space, Eldorado is a rider's haven. The people of Eldorado love to come together and celebrate throughout the year at a variety of places including the Community Center, Senior Center, as well as Vista Grande Library, where once a year they put on an ice cream social benefit. Moreover, Eldorado Community center offers a host of educational classes and support groups. The community association is well represented and much gets done. Some of the events that occur each year are the Eldorado Arts and Crafts Association Home Tour, where over 100 artists open their homes to show their works. There is a 4th of July parade, and a school Halloween carnival, which earns a substantial part of the elementary school's extra-curricular classes funds. There is also a fun run, library ice cream social, silent auction, and community rummage sale. All of these are very successful and well attended. Eldorado is a great place to hike and bike because of its many green belts that were cleverly planned in the beginning of this community. Eldorado also is home to a variety of artists and hosts studio art tours throughout the year. Contact Santa Fe Properties to learn more about Eldorado real estate or to schedule a viewing today!